CutList is a program which looks for optimal ways to cut a list of rectangular parts from a list of available supply pieces. The program is popular but too complex to work on for fun these days, so until I get around to create a commercial version, I code bug fixes only. Finally, after two years, another bug was discovered and fixed. When printing layout diagrams for a solution with no other lists selected, the layout printing was incorrect. Only the final page of supply piece diagrams would be printed. It was fixed today with Cutlist Version 4.03. The layout diagram page titles now also show which solution is being printed. One more feature was to our Latitude/Longitude distance calculator program today. When calculating an end point from a start point, direction and distance, Latitude Longitude Distance Version 3.2 lets the user to choose between Great Circle and Rhumb Line travel . Great Circle travel is the shortest route between two points, but requires continuously adjusting the direction of travel. The new Rhumb Line option allows one to travel at a constant bearing from where you are to where you want go or to explore what lies at a a given direction at a given distance. Just know that constant bearing (Rhumb line) travel is the simplest, but not the shortest way to get there. 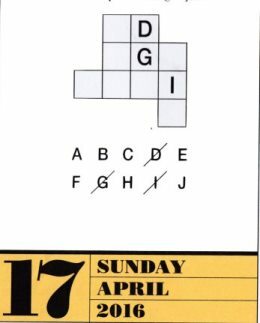 In this No Close Neighbors Mensa Calendar puzzle solver, the user or the program must insert the letters A through J, one per square, so that no two letters in alphabetical order are in squares that touch in any way, even at the corners. Three letters have been placed to get started. In addition, the program has a "Build" mode allowing users to define more puzzles. The two known "ready to build" examples are included.